The major objective of the Allies in the China-Burma-India (CBI) Theater of World War II was to supply and assist Chinese armies in their struggle against the Japanese. The seizure of China's seaports by the Japanese Army had severed its traditional supply lines. To counter this, the Allies transported equipment, men, and supplies to China through Burma by building roads and pipelines, and to India by flying the "Hump" route over the Himalayas. In addition, the Allies aided China by conducting ground and air offensives. In August 1943 at the "Quebec Conference", President Franklin D. Roosevelt, Prime Minister Winston Churchill, and other allied leaders decided that an American Long Range Penetration Mission behind the Japanese Lines in Burma was needed to destroy the Japanese supply lines and communications and to disrupt the enemy forces while an attempt was made to reopen the much needed Burma Road. President Roosevelt issued a call for volunteers for "A Dangerous and Hazardous Mission" which was answered by approximately 3,000 American soldiers. Organized into six combat teams, two to each battalion, the volunteers came from troops across the globe. Some came from stateside, some from the jungles of Trinidad and Panama. The remainder were battle-hardened veterans of battles in Guadalcanal, New Georgia, and New Guinea. In India some Signal Corps and Air Corps personnel were added, as well as pack troops with mules. Fourteen Japanese Nisei linguists trained in Military Intelligence were also part of this group. The Unit was officially designated as the 5307th Composite Unit (Provisional) with the Code Name: "GALAHAD". 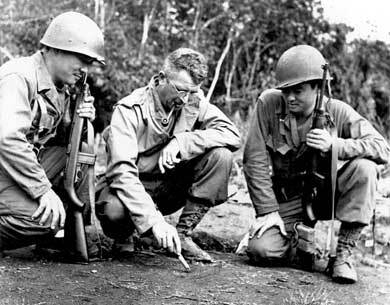 They were later popularly known as Merrill’s Marauders named for their leader, Brigadier General Frank Merrill. After preliminary training operations were undertaken in great secrecy in the jungles of Central India, the Marauders began the long march up the Ledo Road and over the outlying ranges of the Himalayan Mountains into Burma. The Marauders, with no tanks or heavy artillery to support them, walked over 1,000 miles through extremely dense and almost impenetrable jungles. In five major (Walawbum, Shaduzup, Inkangahtawng, Nhpum Ga, and Myitkyina) and thirty minor engagements, the Marauders defeated the veteran soldiers of the Japanese 18th Division, who vastly outnumbered the Marauders. Always moving to the rear of the main forces of the Japanese, who had occupied Singapore and Malaya, the Marauders completely disrupted enemy supply and communication lines. Their behind-the-lines operations culminated in the capture of Myitkyina Airfield, the only all-weather airfield in Northern Burma at that time. At that point, they had behind them over 800 miles of marching over jungle and mountain roads and tracks. They carried all their equipment and supplies on their backs and on the backs of pack mules. Re-supplied by air drops, the Marauders often had to make a clearing in the thick jungle to receive the supplies. Wounded Marauders were evacuated by air, an extraordinary feat in itself. Wounded men had to be carried on makeshift stretchers, usually made by their comrades from bamboo and field jackets or shirts, to an evacuation point. These points were usually small jungle villages, where the Marauders would then have to hack out a landing strip for the small Piper Cub evacuation planes. The brave sergeant-pilots of the air rescue unit would then land and take off in these very hazardous conditions. The small planes, stripped of all equipment except a compass, only had room for the pilot and one stretcher. At the end of their campaign all remaining Marauders still in action were evacuated to hospitals suffering from tropical diseases, exhaustion, and malnutrition. The medical tags on their battered uniforms read “AOE”, for “accumulation of everything”.